Bill Miles, professor of chemistry, is retiring has been elected to emeritus status. He was recognized at today’s 181st Commencement. 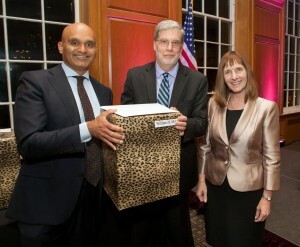 Professor Bill MIles was honored at the annual awards banquet by Provost Abu Rizvi and President Alison Byerly. In 1990, Miles joined the chemistry department as an assistant professor. A rigorous teacher in the classroom and the laboratory, he has taught the organic chemistry sequence and physical methods of structure determination. Through his First-Year Seminars—Science: A Human Endeavor and Medicines, Chemical, and Perfumes from Nature—students engage in archival research and learn about two Nobel Prize-winning Lafayette alumni. Miles also shines as the mentor of legions of students in honors projects, EXCEL research, and the Posse program. Under his initiative, multiple students have been awarded prestigious Barry Goldwater Scholarships. His knowledge, enthusiasm, and passion for his subject fostered many students’ aspirations to pursue graduate programs and careers in chemistry. It is no wonder that he was a recipient of the Marquis Distinguished Teaching Award. As a world-class, synthetic organic chemist, Miles’ research focuses on the chemistry of furan compounds, and he has most recently been funded by a competitive grant from the American Chemical Society-Petroleum Research Fund. His interest in g-hydroxybutenolides has advanced through collaborations with other experts in the field, as well as with students, and his efforts have resulted in refereed journal articles of international impact. Miles has been a dedicated and conscientious citizen of the department, the College, and the profession. In addition to his membership on numerous committees, he served as department head and director of research services, and chaired the Lehigh Valley Section of the American Chemical Society. But he has had another role that is difficult to guess. He is the Chemistry Department’s undisputed “grillmaster.” For many years, at department picnics for faculty and students, Miles has taken charge of preparing and grilling the burgers (cumin is his secret ingredient) and hot dogs. His colleagues have made it clear that he is welcome to continue in that role in his retirement—no one dares challenge his mastery of the grill!